A castle. A curse. One dangerous holiday … Kate and her friends are spending the summer at Darkmere Castle in Devon which she thinks will be a perfect opportunity for her to get together with Leo. But instead, she s drawn into the dark story of an nineteenth-century girl who haunts the tunnels and towers of the house … and whose curse now hangs over them all. 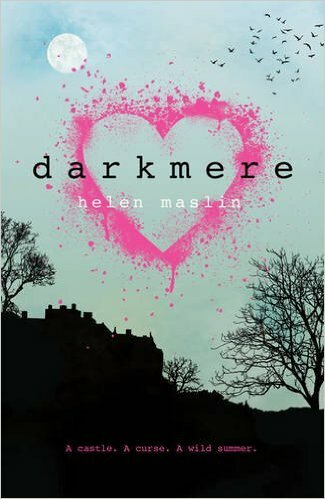 Darkmere is described by the publisher as ‘Heart-stopping, gothic and dangerous’ and I would certainly agree. I was sent a review copy prior to YALC (YA Literature Convention) and by about halfway I was searching through amazon to find out what else the author had written. I was certainly surprised to find out that this is her first book! I don’t want to give away much of the plot, but there are two cleverly intertwined stories. The first is a very modern one, with a group of teens taking a holiday in an inherited castle. The castle has been inherited by Leo, and he is very much in charge of the group. Kate has always felt an outsider, but hopes that being invited along by Leo will help her to finally fit in. The other story is an historical one, telling the tale of Elinor, who’s also an outsider trying to fit in. She marries St Cloud, and becomes Mistress of Darkmere, but life there is not what she expected. The thing which I loved about Helen’s writing is that the two main characters had such distinctive voices.. moving between the two times was an easy transition, as each told their own story in their own way. And yet, despite the different times and storylines, and the distinct voices, there were lots of similarities. At no point did one strand pull you away from the other, they complimented each other so well. The two stories become more and more entwined, as Kate starts to question whether Darkmere is haunted. Helen writes scenes which create just the right level of unease.. it’s not a scary book as such, but certain parts are rather creepy. It builds to a tense, heart-stopping conclusion. Darkmere is a dark YA novel, with lots to appeal to both teens and older readers. I loved the characters, the storylines, and the writing, and this is a well crafted novel. It also has a gorgeous cover! It’s out at the beginning of August, and I highly recommend it.